Chair massage is a form of massage that is administered by a massage therapist while the client is sitting in a chair that is designed specifically for massage. 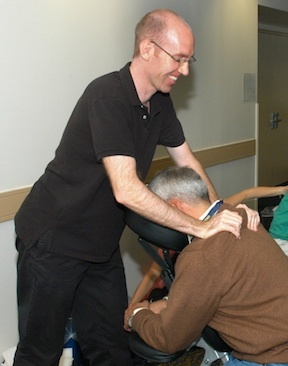 Chair massage focuses on the neck, back, scalp, and upper body. 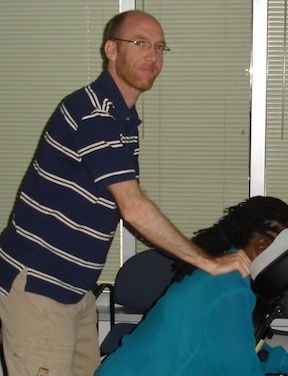 Chair massage is an excellent supplement to most work environments. Chair massage can help reduce stress and fatigue, and help promote alertness and productivity. It is also very affordable. Chair massage reduces muscle tension, which is major contributor to chronic pain, repetitive strain injuries, and low back pain. It also boosts alertness & reduces stress. Massage increases circulation & calms the nervous system. Lastly, it provides a complete change of pace so the body and mind can relax and rejuvenate. Why is chair massage perfect for the work place? Chair massage is perfect for the workplace because it usually only lasts from 10-15 minutes per person. It is applied directly through clothing and there are no lotions or oils used. It addresses tension primarily in the upper body (back, neck, shoulders, scalp, arms, and hands), but creates a sense of well-being throughout the whole body. Chair massage leaves employees feeling relaxed, refreshed, and ready to return to work. PROVIDING CHAIR MASSAGE FOR YOUR EMPLOYEES IS GREAT FOR MORALE. CHAIR MASSAGE EVENTS ARE FUN AND ARE A GREAT WAY TO HELP EVERYONE RELAX! Corporate Chair Massage Rates Vary Depending on Several Factors. Discounts are provided for recurring Monthly and Quarterly Corporate Chair Massage Events. Discounts offered for on-going monthly plans. chair massage into your next event! CHAIR MASSAGE IS THE PERFECT ADDITION TO TRADE SHOWS, SPECIAL EVENTS, SPA PARTIES, SPORTING EVENTS, EMPLOYEE APPRECIATION DAYS, AND ANY OTHER TIME OF CELEBRATION!